Recently I entertained some coworkers who were visiting from across the pond in England. They were here for long enough that there were some good opportunities for dining, target shooting, and touring. During the course of our conversations I picked up an interesting fact. 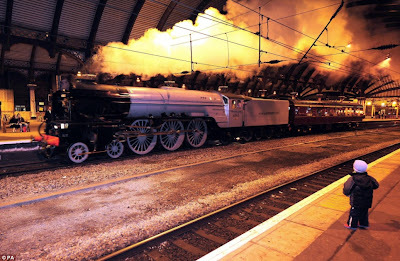 There is actually a brand new steam locomotive in Britain which has recently been completed. When I say new, I don't mean, completely rebuilt, I mean built from the ground up. The new locomotive was based upon existing plans, and locating these must have been an adventure in and of itself. The end result is beautiful. When I first saw the pictures I could barely believe that it was real. The glossy paint and bright colors made it look more like a brand new model than the real thing. But it is indeed real, and it has recently completed testing so that it can be used on major railways in Britain. I hope that future generations get as much enjoyment from this locomotive as I have from the many antique steamers I have seen. Wouldn't the ruling Greenies over there have a conniption fit about that? The U.K. has glommed onto the AGW scam hard, and just the thought of a smoke belching behemoth would make them faint. It does look cool in a kind of Art Deco, 40's ish way. You would think so, but apparently it doesn't look enough like an eeeeeivil SUV to be a problem. The design is essentially a post-war one. I don't necessarily associate it with a deco look, but I can see what you mean. 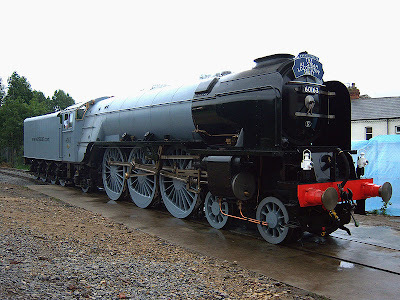 Most British (and many European) locomotives tend to have very clean lines with shrouded pipes and fittings. Not at all like American locomotives which typically put everything out in the open.